This short freeway linking the Garden State Parkway and I-80 actually doesn't end at either of those; its north end is slightly past 80 in Paterson, and its south end is underneath US 46 on Broad Street (despite the fact that the Parkway exit is treated as the mainline). 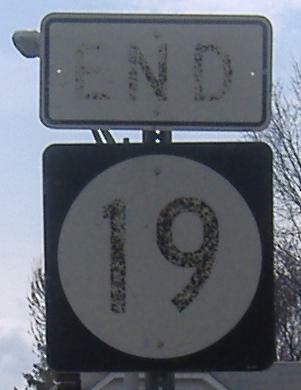 There is, indeed, an END 19 assembly at the proper place. The freeway was planned for grander things, though, supposed to extend northward to the top of Paterson, where NJ 20 currently ends. 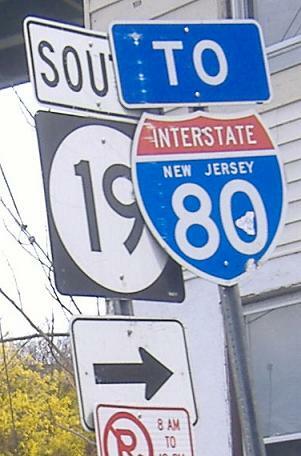 And surprise, the whole loop would have been called NJ 20. For awhile, the north end of NJ 19 was stub ramps at I-80, until that interchange got built out a little to extend into Paterson and have better access from WB 80. This is the first BGS on NJ 19, and indeed is just south of its new beginning in the heart of Paterson. 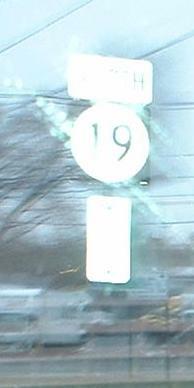 And yet, NJDOT messes up with a very strange 19 shield. Ah, well. Because of the stubs getting turned into a highway headed into, rather than over, Paterson, SB-WB traffic must use Spruce and Grand Streets instead of a direct ramp. From Grand Street EB, and then up the ramp from Grand. 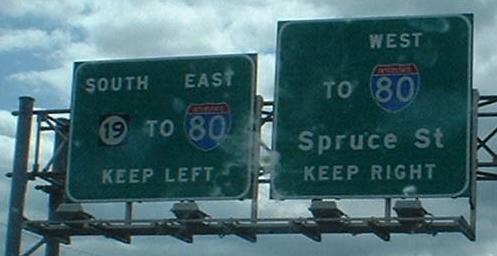 If you don't exit onto I-80 WB, you end up on NJ 19 SB. The ramp from I-80 WB to NJ 19 SB (most traffic is coming from 80 EB to get to the GSP SB) winds to the north side of the interchange and back, so that after passing under I-80 you can see the BGS for the EB loop ramp, even though you haven't merged with 19's mainline yet. 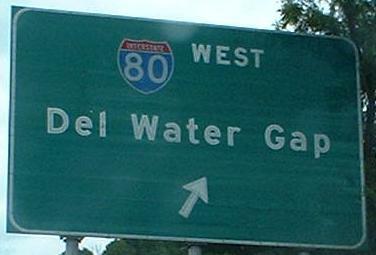 This was on NJ 19 SB at Valley Road, the first exit south of I-80. It's gone, replaced by a new fully reflective copy, or else I'd have my own version of it up. You can see in the first photo how the Parkway movement is straighter and looks more like NJ 19's routing. And that button-copy just pops off the sign! Just past the upcoming overpass is the end of NJ 19, as the median barrier ends and you're on Broad Street (CR 509, which just joined from Broad St. behind me). 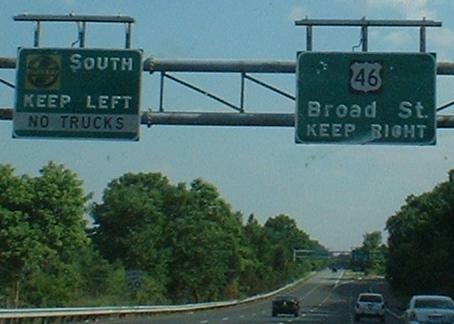 TO US 46 EAST is a little misleading, as the next right turn is a jughandle that allows a U-turn to access the ramp to EB 46. Replace TO with a NEXT RIGHT on the bottom. What a difference a year (or five) makes! Turning right around, this is the beginning of NJ 19 NB from Broad Street, at Colfax Avenue (which goes east to meet NJ 20 at US 46). 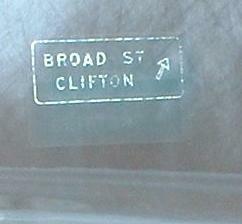 Right away, Broad Street traffic is given a chance to get out of being part of the freeway. 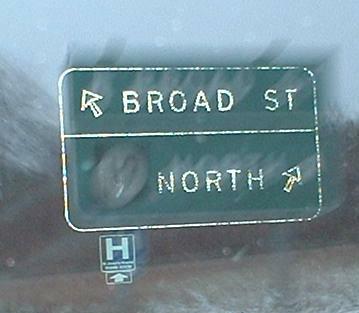 This section of Broad Street turns into Grove Street just south of this exit and heads slightly more west than Broad to gradually diverge. 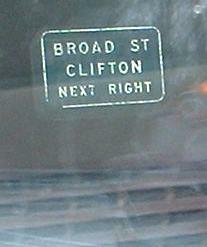 And sure enough, the next exit is also for Broad Street. I think the first exit is only to prevent local traffic from getting scared that they're suddenly not on a street anymore. Continuing northward toward Paterson, stopping just shy of descending into the heart of the city where NJ 19 ends, and instead proceeding up the I-80 WB ramp, which is where the last two photos are located. Had the 19 freeway been completed as NJ 20 around the west and north of Paterson, the Grand Street exit would make some more sense than it does now, since local traffic can get on the highway just a few blocks north anyway. The first two photos are the left and right of the same gantry.